Dimensions: 8 x 6 in. 160 pages. Hardcover. The bunnies are back—and there’s only one thing on their minds. 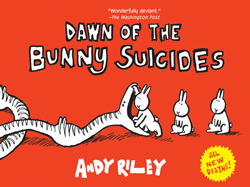 From the author of the bestselling The Book of Bunny Suicides and Return of the Bunny Suicides comes a whole new batch of fluffy little rabbits who just don’t want to live anymore. Twice as long as the previous books (over 150 deaths!) and in hardcover for the first time, this volume offers more bunny for your buck than ever before! Whether they’re getting stomped, stabbed, or sautéed, impaled by pink flamingos, or done in by heavy metal drummers, this collection of rabbit-related self-destruction has it all. Dark, twisted, and perfectly irresistible, it will be a must have for new and old Bunny Suicide fans alike.